Well you might have to plant a few first. What am I talking about? How to create your very own woodland filled with native plants. I have written before about how important native plants are to our survival. To read about it, click here. Now I am going to tell you how to create a shade garden in which mid-Atlantic native plants thrive and multiply with abandon. Note: There is a Part 2 with more suggestions, click here. It is really quite simple. All you do is take one woodland area, mix with generous amounts of compost, add the appropriate native plants, and wait a few years. The key is knowing which plants to use. I started with the worst possible soil in the worst possible conditions. Not only were the beds composed of the hard baked clay and rocks prevalent in our area, but they were filled with roots from 100-year-old London plane and—hold onto your hats—black walnut trees. Add to that, years of trash, including roofing slate and coal furnace shovelings, dumped in the woods before municipal collection came along and construction debris from the 1960s. Nature does not dot the landscape with precious collectibles but “designs” with large sweeps of single types of plants, and that is what I have done in my woods To create a woodland like mine, all you do is plant at least five but preferably seven and ideally nine of the plants profiled below in beds amended with generous amounts of compost, mulch heavily with ground leaves, and stand back and wait. Really….that’s what you do….it works. Virginia bluebells, Mertensia virginica: porcelain blue flowers top blue-green leaves in March and April, goes dormant when hot. All my plants came from one plant given to me by a friend. Celandine poppy, Stylophorum diphyllum: lovely filigreed leaves are covered with large bright yellow flowers in April and May. Again, all my plants came from one plant given to me by a friend. Dwarf Jacob’s ladder, Polemonium reptans: wintergreen fern-like leaves are followed in April and May by copious blue bell-shaped flowers replaced by ornamental chartreuse seedpods. White violets, Viola striata: white flowers in April and May. All my plants came from one clump dug from my woods. 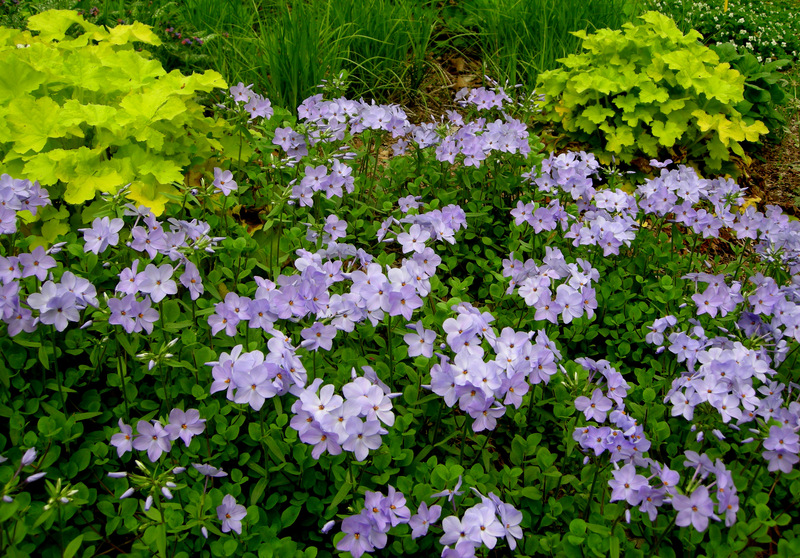 Blue creeping phlox, Phlox stolonifera ‘Blue Ridge’: wintergreen mat of foliage is topped with blue flowers in April and May. Creeping phlox, Phlox stolonifera ‘Sherwood Purple’: creeping phlox comes in blue, purple, white, and pink. The purple is the most vigorous. Native ginger, Asarum canadense: the reddish purple flowers appear below the leaves. Golden groundsel, Senecio aureus: the wintergreen leaves are topped by attractive purple buds in March followed by fragrant yellow flowers in April and May. 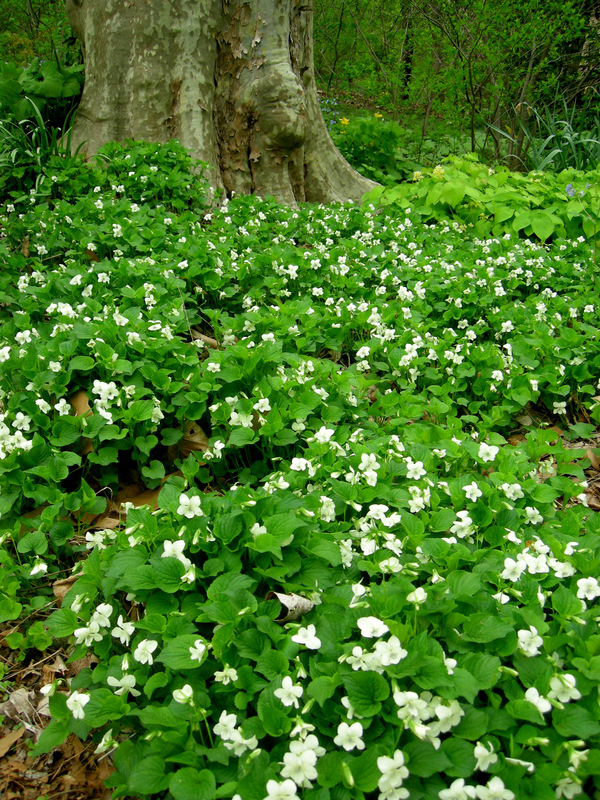 This vigorous spreader is a great native substitute for vinca, pachysandra, and ivy. 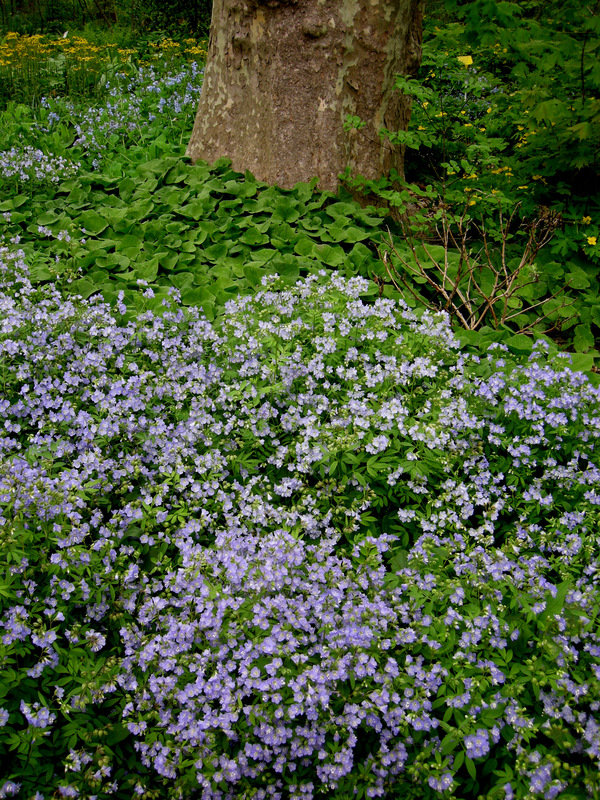 Blue wood aster, Aster cordifolius: the leaves of blue wood aster completely cover the ground in the spring. 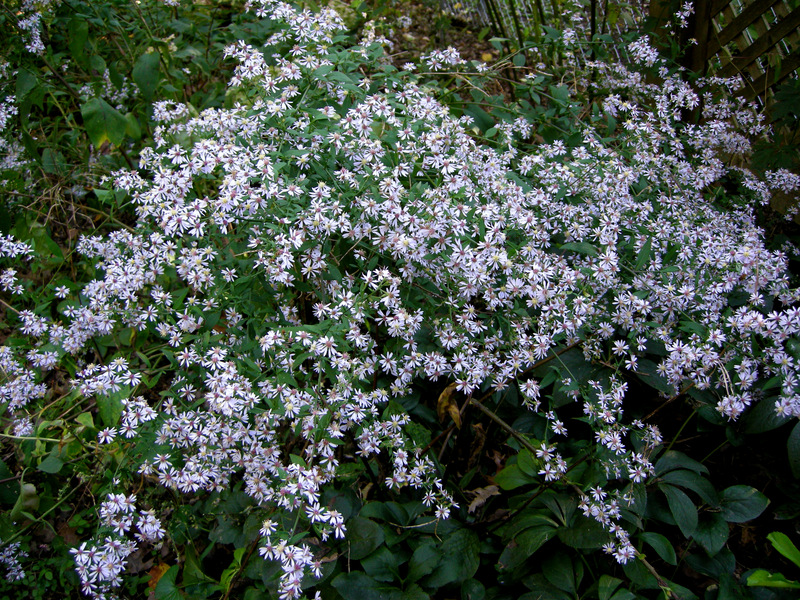 Blue wood aster is covered with flowers in October and November. Northern sea oats, Chasmanthium latifolium: pendulous oat-like flowers grace this native shade grass in October and November. The foliage ages to a lovely khaki color that remains ornamental through winter. The flowers of northern sea oats in the slanted light of fall. 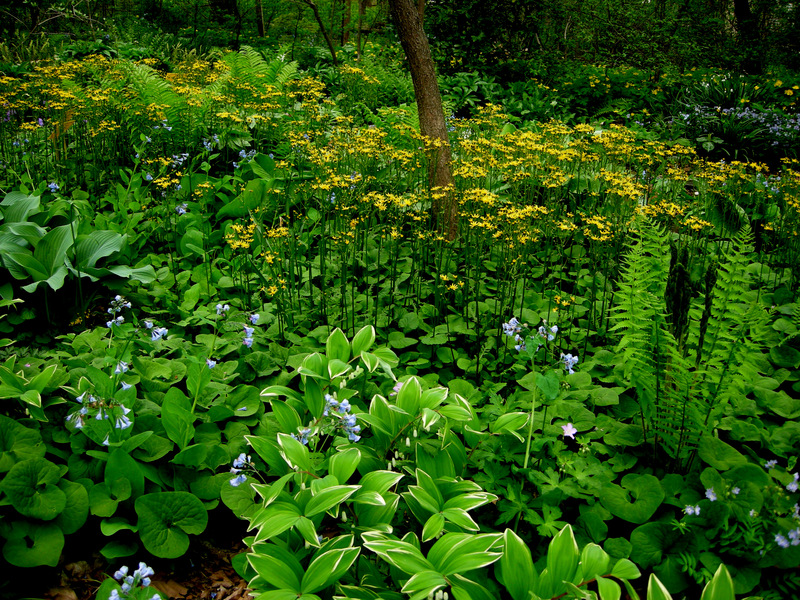 As the spreading, woodland plants profiled above establish themselves, you can add pockets of other special natives like trilliums, jack-in-the-pulpits, mayapples, bloodroot, and ferns. The result is magical. Nursery Happenings: My Native Wildflower Weekend will take place Friday, April 6, from 10 am to 4 pm, and Saturday, April 7, from 10 am to 2 pm. Look for an email listing the native plants available if you are on my customer email list. 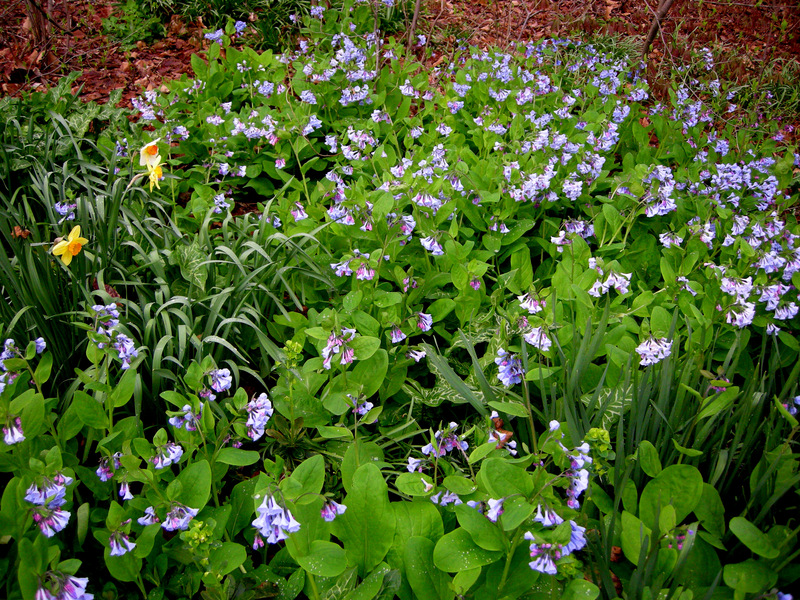 This entry was posted on April 2, 2012 at 6:47 am and is filed under Fall Color, groundcover, landscape design, native plants with tags Asarum canadense, Aster cordifolius, black walnut trees, blue wood aster, Carolyn's Shade Gardens, Celandine poppy, Chasmanthium latifolium, creeping phlox, dwarf Jacob's ladder, golden groundsel, Mertensia virginica, native plants for shade, native white violets, native woodland, northern sea oats, Phlox stolonifera 'Blue Ridge', Phlox stolonifera 'Sherwood Purple', Polemonium reptans, Senecio aureus, Stylophorum diphyllum, Viola striata, Virginia bluebells, wild ginger. You can follow any responses to this entry through the RSS 2.0 feed. You can leave a response, or trackback from your own site. Beautiful photos of what appears to be a truly magnificent woodland. 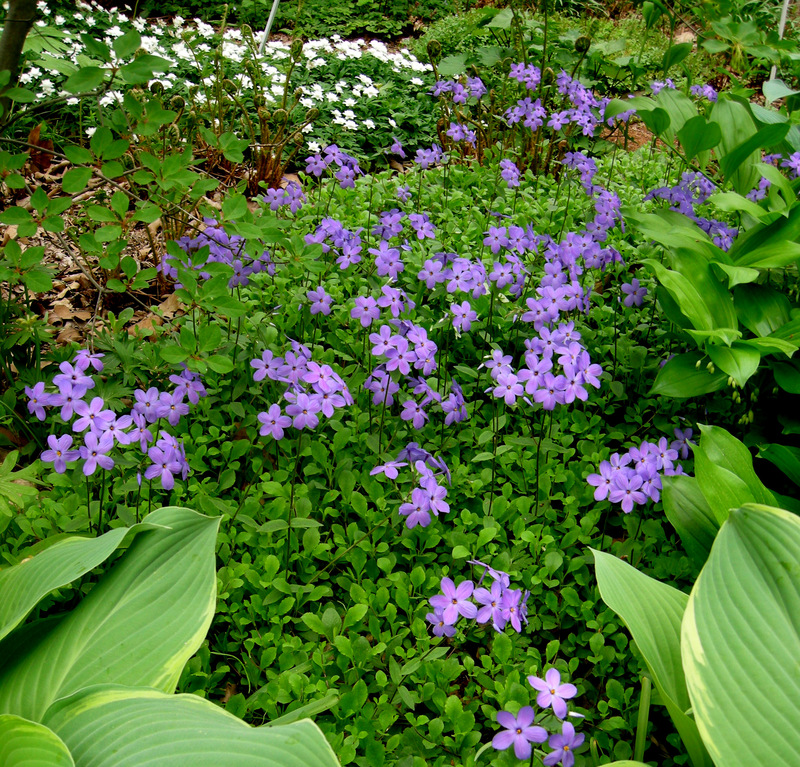 I too love violets and would suggest that the Confederate violet with its purple eye on white should also be part of any woodland garden. 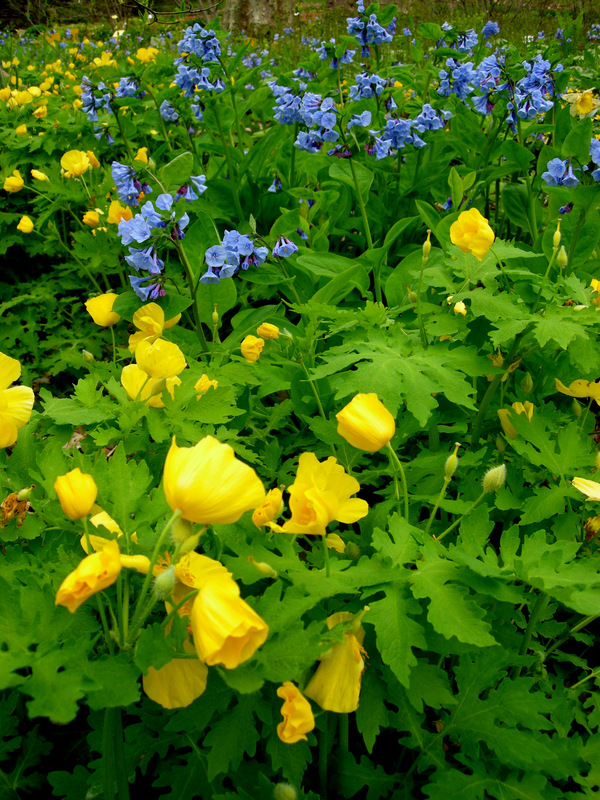 Unfortunately, I planted the Celandine Poppy in my slightly more cultivated woodland flower beds where it looks lovely, but like the Virginia Bluebells, it is threatening to take over the entire area. The native Jacob’s ladder did a reverse colonization from the neighboring woods to my garden beds. 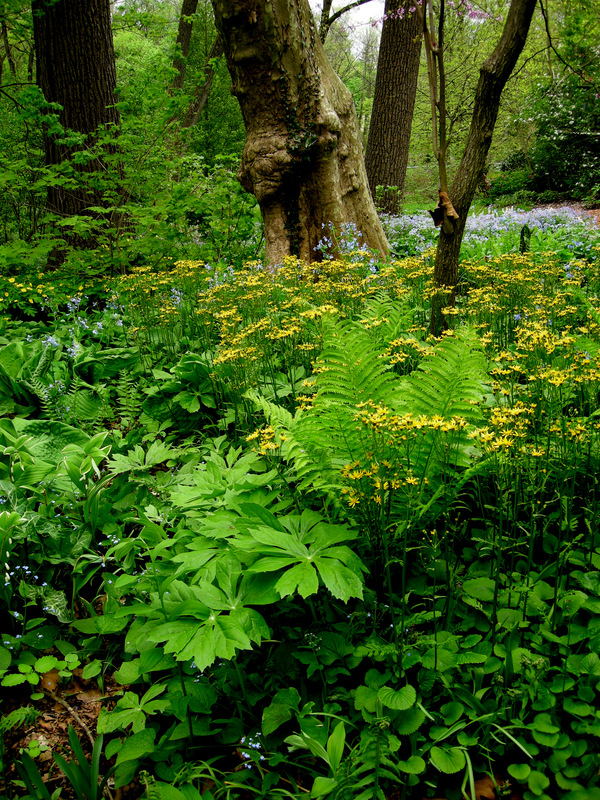 I hope lots of folks are inspired by this post to cultivate their own woodland gardens. I love woodland plantings and yours is so beautiful. 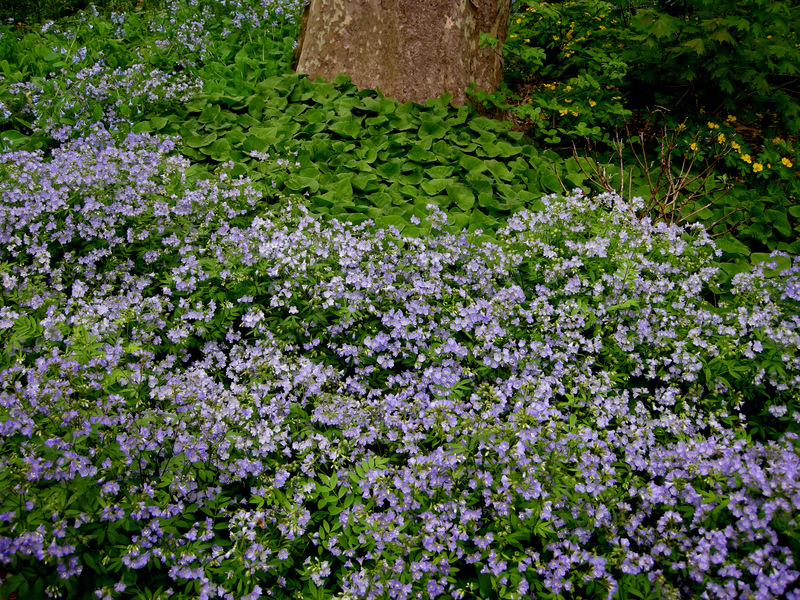 I remember woods like this in PA, and I just love drifts of violets, so pretty. Carolyn, very inspiring and timely, thanks. I was just starting to read up on natives. Will these plants spread through English Ivy and pachysandra. I have an existing woodland area with those two, mayapples and vinca. I’ve been debating about ripping out the English Ivy (which I hate) but that seems so daunting. This is what I am trying to accomplish in my shade garden. It is absolutely beautiful. Mine is slowly getting there with some different plants (solomon seal, ginger, snakeroot, virginia bluebells, ferns are the main ones). I can see better where I am going wrong -more plants of the same !! Thanks for a great post. Carolyn I am finally getting in some natives that I can then divide and spread throughout the garden..that is my plan this year..take an inventory and then plan for next year…I usually plant too few of one plant so I will be remedying this…great post and gorgeous woodlands! In my woodland garden, Ostrich fern which I believe is a native plant seems to qualify as something that threatens to take over, but is surely beautiful. Slower to arrive and to expand its turf is the native Solomon seal….less showy and aggressive than the variegated form. It is beatifull woodland ,I love plants and woodland plants.You post is wonderful .Everything in nature is fantastic and gorgeous . I have a area on the edge of my property with a lot of young maples and pagoda dogwoods that have selfseeded. The house sat empty for a couple of years before we bought, and during the almost 6 years that we have owned it, these trees/shrubs have been growing. They are now about 8 -10 feet tall, and I have long wanted to make this scrubby area into a Woodland Walk. Great ideas about plants I can use in this area. How absolutely breathtaking! Great post and excellent recommendations some of which will work in other zones as well. I adore my woodland poppies. They are really amazing this year. It looks amazing, and if I had room for it I’d head down that road in a split-second! As it is, though, I think my garden space is so restricted that the attempt would look a bit “twee”, so instead I relish in the fact that the white woodland anemones are beginning to bloom in the forest near my garden; that’s a scenery I could never even begin to rival. I will restrain myself to planting some small woodland flowers under the shrubs in my hedgerow towards the road; they might not give the sweeping display that nature creates, but it will be flashes of colour, and plants that have developed to grow in that sort of environment. So beautiful Carolyn, amazing that those lovely drifts of plants come from a single plant. I always marvel at what you have achieved on your property … simply beautiful! Carolyn, you really do show me where I go wrong with our woodland. One reasonably large area is smothered with Geranium macrorrhizum and it does look good. The other larger area is dotted with as many different woodlanders that I can fit in, and as you well know it just doesn’t work. I will have to rethink it. I am very taken with your Mertenisia Virginica and the Polemonium Reptens. Useful advice, good writing , and stunning images that illustrate your text, all contribute to making your blog consistently superb. This post is what great blogging is all about. Your garden is my dream garden. I had to smile when I saw the title of this post as my post on Friday will be similar. It seems woodlands are so definitely the place to be. I find the amount of the flowers you have to be so great. Amazing how similar our 2 woodlands are, I have used English bluebells, Hyacinthoides non scripta, and the yellow Welsh poppy, Meconopsis cambrica, both are allowed to self seed to their hearts content. We also have an area of Fritillarea meleagris, which is also a native here, in a damp area of the woodland and again it is seeding itself about happily. This is my favourite area of the garden. I did enjoy that film … Not much happens in my woodland garden after spring. Interesting to see that you have some options for other seasons. I’ll take on board your tip that less is more. It looks wonderful. I would like to do something similar but I feel that when you look at the UK’s native floral you need to decide where you are going to draw a line. We have had imports for centuries, going right back to the Roman times and so many plants that we consider to be natives arent actually but it is certainly food for thought and I shall have a think. Loved your post. I think you convinced a few people that natives are the way to go to create a natural landscape. Carolyn, What a lovely and inspiring post! I wish I had a shady garden big enough for these natives. I do have 2 small patches of Virginia Bluebells that I adore (I just have to remember where I planted them which is sometimes a problem). My mom has the perfect woodland garden for these plants. Now if I can just get her to take your advice and pull out some of her pachysandra! I also just ordered “Bringing Nature Home”. One of my friends just recommended this to me last week. Great photos and native combinations Carolyn. All your hard work has really paid off! You must have put in a lot of time to clean out all that junk. The planting is beautiful, a reward for all your work. I have a few of the same plants in my garden. A wood poppy showed up in my garden this spring. What a wonderful surprise! Your woodland is really beautiful. Great post! Fab pics that would inspire anyone to start a woodland garden. We intend starting one next Autumn. Now THAT’s a garden–just glorious. You make me feel so much better! our ‘new’ woodland is being created from a former cottonwood/concrete/beer can swamp. Layers of cardboard, truckloads of Moo-doo and hours of backbreaking work and we are just beginning to make progress. Our native bleeding hearts are moving in already. Thanks for the recommendations, Carolyn! A lot of those plants are native/grow well in the Midwest, too. I inherited my woodland garden, but I must say once established it’s not too difficult to maintain. 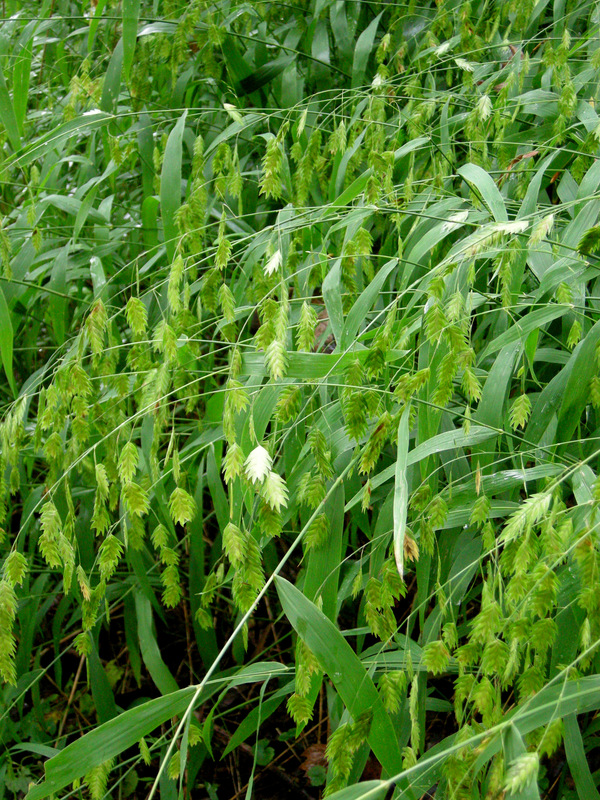 I love the Sea Oats–I’m thinking about planting some here. Not only beautiful plants but they look so great together. I think your work is what so many dream about when we are taking walks through the woods. Your woodlands are a testament to your skills as plantswoman Carolyn and this post very encouraging as the rules are simple and you did not start out with heaven at your fingertips. You’ve had so much success changing your property to one filled with so much plant life, it’s a real inspiration. We have tiny pockets of trees right now that I’m trying to add to with the hope that one day they will expand to little stands of woods. My greatest hope would be to see the ground of these tree pockets coated with native flowers like yours. This post is inspiring. 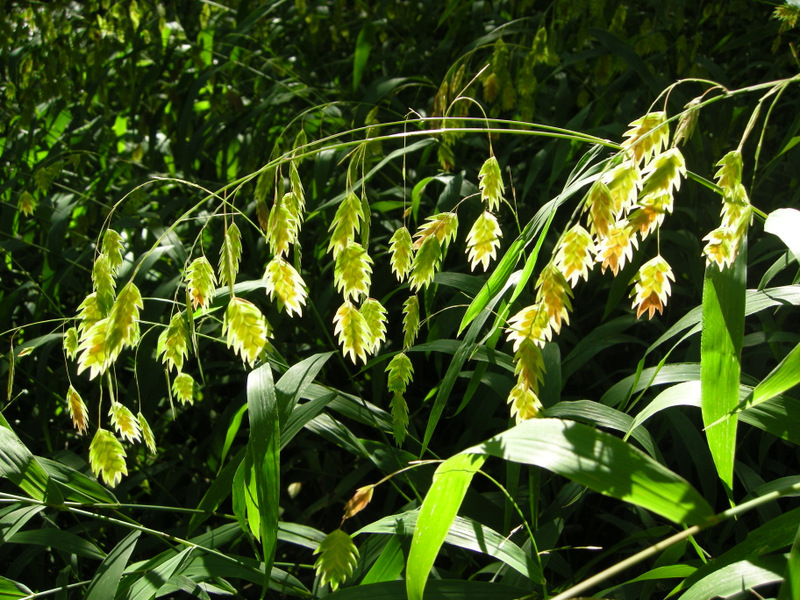 My woods could really use a nice introduction of some of these wonderful plants – especially love the sea oats! Your woodland garden is inspirational! I love the sweeps of native flowers that you have. It is my dream. You do give me hope. I have a single Jacob’s Ladder plant. Now, how many years before mine spreads to look like yours? One warning for your readers is that there is another form of the Wood Poppy which is not native, and some say worth weeding out of your woodland landscape. On the surface it looks similar with smaller yellow flowers and finer cut foliage. It doesn’t produce the handsome pendulous seed pods, but an upright linear one filled with seeds that will invade. Carolyn, the garden is stunning! I lust for the bluebells and the celandine poppy. A question that I don’t see asked (but I may have missed) is what happens in this area when the bluebells go dormant? I have a large bed that is filled mostly with hosta and some fern. I have sprinkled in some other woodland plants. Could the bluebells and celandine poppy be added to my garden so they come up first and then be followed bt the hostas and others woodland plerrenials? Lovely woodland. As I continue to remove invasive English ivy and a host of other nasties, I will look to this as inspiration — the light at the end of the proverbial tunnel. I think I will draw the line at the sea oats, however. After years of ivy pulling, the idea of planting something equally vigorous and hard to remove worries me a bit. 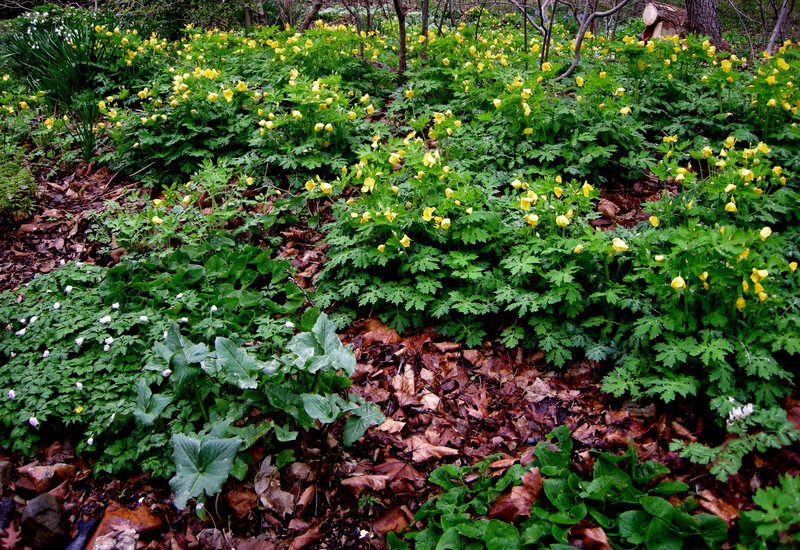 Also, in my southern garden, Celandine poppies generally do go dormant at some point in the summer, so I do look to ferns and hostas to provide lushness throughout the summer. And snail food too (at least the hostas)! Hi Carolyn, Some of these plants I am well familiar with, others are new to me. Love the Celandine poppy, Stylophorum diphyllum, Blue wood aster and the Golden groundsel, Senecio aureus. Carolyn, Taking a break from reading papers (okay, procrastinating :-|) by catching up with your blog. This suggests yet another project for my “garden of the imagination.” A good place to create this kind of woodland garden would be along the woods side of my driveway. This is very helpful! I’m in Virginia with pretty much the same conditions (clay, rocks, trash, etc..) Can’t wait to rescue my woodland!!! We moved into Tobyhanna, PA in the Pocono Plateau Region, at the top! in zone 5. Under the many beech and few striped maples is only dropped branches, twigs, leaves, rocks—-nothing else. At the very edges are ferns and some mosses. If we composted and planted as in your terrific article, would they really thrive even with the deer? Thanks! I planted all of these a few years ago in a small trial garden in my West Michigan woodland edge (zone 5). I’ll be expanding the scheme spring. I have to spray the asters for deer, and I won’t be adding more. Everything works very well and looks beautiful together. The wildflowers in my woodland that are happiest are: Trillium grandiflorum, Podophyllum, Jeffersonia, Caulophyllum, Claytonis , Sanguinaria , Mertensia, Dicentra canadensis, Erythronium. Of course the latter three are ephemeral. I forgot to include Solomon Seal, Snakeroot and Wild Ginger as seeding themselves throughout as well as our native Pachysandra, so much more interesting than the Japanese. It should be used more often. If you are ever in the Southern Tier, I would love to show you my garden. 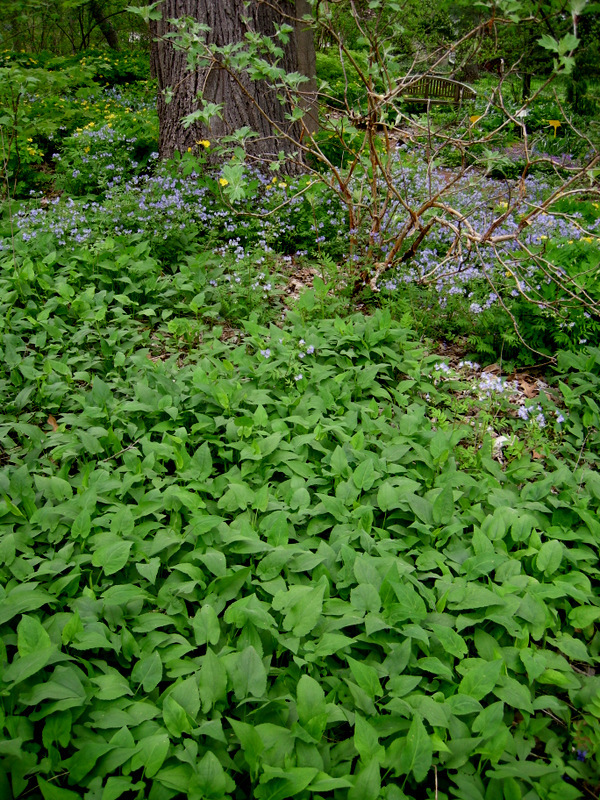 In this list Solomon’s seal and wild ginger would both be good replacements for non-native ground cover, although Solomon’s seal doesn’t spread fast enough to be more than an edger. Snakeroot is a menace and I wish I had never planted it in my garden. It comes up here and there and never really makes a statement—just my opinion. Native pachysandra is not a replacement for Asian pachysandra, and I wish native plant groups would not market it as such. I have two clumps in my garden which are quite pretty but have barely increased in size in 20 years. Whatever replaces pachysandra has to be aggressive! I am concerned about the Japanese knotwood in my neighbor’s yard encroaching on my woodland plants. I’d like to find a native to plant that could compete with the aggressive behavior of the knotwood. Any suggestions? Not many plants can compete with knotweed. The only one I have been successful with in a knotweed area is ostrich fern. I have a wooded area that is partially cleared out for a sport court. The surrounding area immediately around the sport court gets a lot of sun and the tall trees shade most of the rest. The entire area has been completely taken over by garlic mustard 2-3′ tall. I am going to have 1/3-1/2 the area cleared out pulling them up but the whole area is just too large to deal with. I have read that if you weed whack the garlic mustard while it is flowering, walking the flower tops and working down to the ground, it works well. Then I plan to plant the English Bluebell bulbs. I’ve read a little about them and apparently they are invasive to this area. Ideally I would like to have something native to Virginia growing there but don’t want to spend a ton of money filling the areas or time. Also I really don’t want to continually have to get the weeds out of that area and the fact bluebells spread so rapidly works well for this situation. My wife wants something to look nice as well. Do you have any other suggestions or think bluebells are an issue? There is only about an acre of woods shared by a few houses so I don’t think there would be an issue of them spreading into a very large area. Although there is a very large wooded park area and creek a couple hundred feet away that stretches for miles throughout the area. 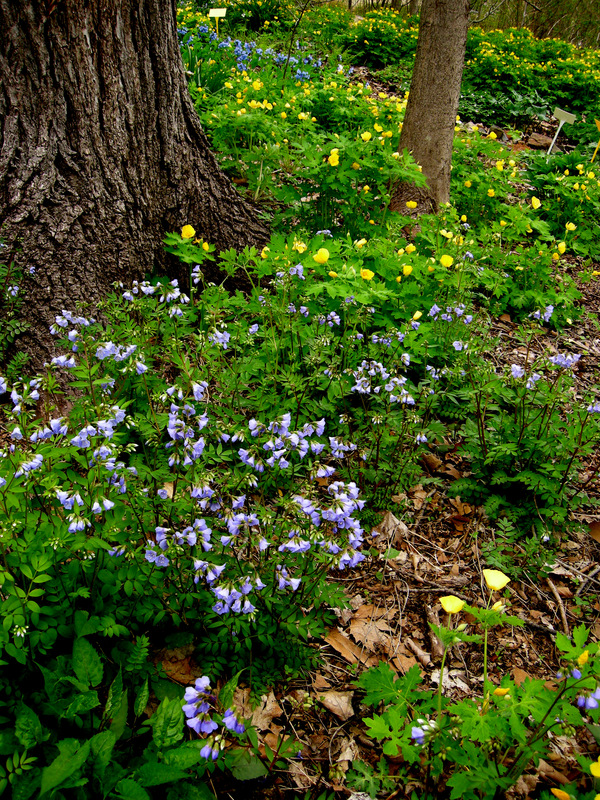 Do Virginia Bluebells spread like the English? I don’t see them for sale at brecks where my wife buys flowers. Virginia bluebells spread like crazy and are a wonderful plant so if you are intent on planting bluebells you should use a native. However, VA and English both go dormant when it gets hot so they aren’t my idea of a plant to fill a space and prevent weeds. Read my post on what you should use: https://carolynsshadegardens.com/2016/04/26/strike-a-blow-for-the-environment-in-your-own-yard/. 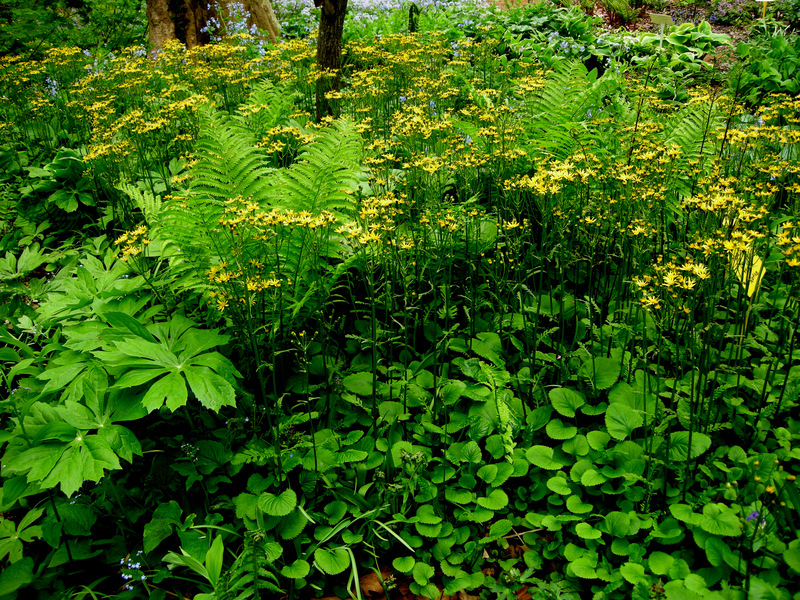 I recommend golden groundsel Senecio/Packera aureus/a for what you want to do. It’s there all year and makes a weed-choking mat. 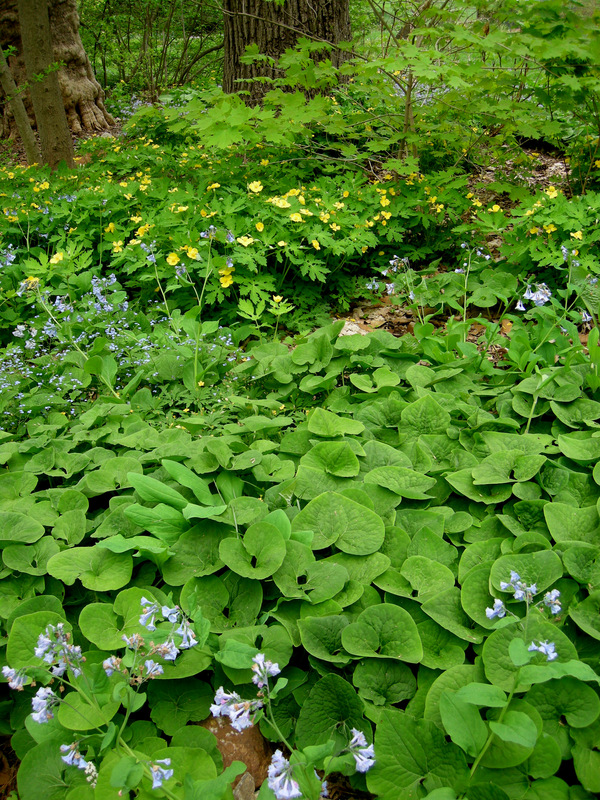 Garlic mustard is a biennial and must reseed to survive. Pull it all out before it sets seed an you are done. Thank you this is very helpful. Do any of the 9 plants you recommended in the “If you build it they will come” article also do well in mostly sunny spots or partial shade to mix in with the golden groundsel? Or do you have a suggestion for something else for the mostly sunny area? I am hoping the golden groundsel will also do well there. And do you sell any of these that you ship to VA? All the plants in that post do well in part shade. You will have to do your own research regarding sun plants as that’s not my area. I do not ship these plants but I have plenty of customers who come here to shop from all parts of Virginia. Will these plants work in Connecticut? I would think they would, but I always recommend that gardeners that are not in my zone do their own research about plant suitability. Thank you for reposting this excellent article. Indeed, I have had great success with a few of these beauties about 8 miles away from your location in my shady to partially sunny area around my deck on my 1/3 of an acre paradise!